While visiting family this past week I discovered this wonderful game created by my niece. Naturally, I had to snap a quick shot to share here. To create your own all you need is a small block of wood (this one is about 3×4 inches), a drill (requiring adult supervision! ), and golf tees. 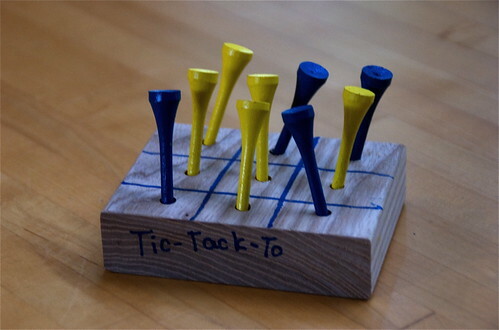 If you can’t find colored golf tees, I’m thinking it would be fun to decorate those, too. What I love about this as a project is you can let your child be as creative as they like with the decorating, and it’s ok to stay with simple & functional. Either way, it’s a fun toy to entertain for years to come. I love it! I think I’m going to try it. So simple so cool. Great idea! You could make a little bag for it, and take it along to restaurants to entertain the small ones.